Unseen Empire Strikes Back Storyboards Detailing the Battle of Hoth! The Battle of Hoth - the grandest battle of the original Star Wars trilogy. The battle features all the tension of Yavin, machines more fearsome than those in the Battle of Endor, and a vulnerability not seen in the rest of the series. How did this epic battle sequence come to be? Take your first look at some never-before-seen concept art that shows how every shot in the desperate defense of the rebel base was planned out. A small number storyboards used for the early conceptualization of The Empire Strikes Back reside in private collections, and the storyboards command thousands of dollars at auction. These boards and are based on the fifth draft of the script for the movie — and most of the boards here are being shown publicly for the first time. These storyboards show off the work of Joe Johnston (designer of Boba Fett's armor and director of The Rocketeer and this past summer's Captain America: The First Avenger), plus Nilo Rodis-Jamero. After finalizing the shooting script of Empire Strikes Back, George Lucas commissioned a final set of storyboards, storyboards likely residing in a Lucasfilm vault behind more metal and lasers than Walt Disney's frozen head, with the final documents protected by guards from THX 1138. 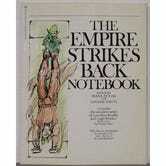 1980's The Empire Strikes Back Notebook shows few of the final draft storyboards. Enjoy these early storyboards of the Battle of Hoth, presented in chronological order of the sequence. The art in this gallery is courtesy of the collection of Guy Van Gompel, with exceptions noted. Han Solo steps off of his tauntaun while searching for Luke Skywalker. From a private collection. A Hobbit-like apparition of Obi-wan looms over the terrain of Hoth. From the Propstore of London. An injured Luke Skywalker reaches out for the ghost of Obi-Wan Kenobi. From the Propstore of London. A snow speeder passes by as Han Solo finds Luke Skywalker. A probot eyes the shield generators protecting the Rebel base on Hoth. Tie bombers and tie fighters circle an Imperial star destroyer, ready to bombard the Rebel base on Hoth. Warned of an attack, the Rebels launch personnel transporters accompanied by X-Wing fighters through the energy shield defending the Rebel base on Hoth. An Imperial star destroyer looms over Hoth. A Rebel transport flees Hoth, with energy beams serving as cover fire. Snow speeders take off to meet Imperial ground forces. Fear sets in, as snow speeders witness the immense Imperial AT-ATs in the distance. Snow speeders careen over the top of an AT-AT. The start of the classic "cockpit talk" scenes. The art on the cockpit storyboards were often copied to keep the artists from re-drawing the extremely detailed interiors. In this scene, Luke tells the others to use their harpoons and tow cables to take down the AT-ATs. Dack, firing the guns in the rear cockpit of the snow speeder Luke is flying. Wedge Antilles, survivor of all three major original trilogy battles! Wedge looks a lot like the deceased Biggs Darklighter in this storyboard, doesn't he? Wedge watches from his cockpit as Rebel troops flee their posts. Initiation of the snow speeder tow cable maneuver! Wedge Antilles makes the pass to trip an AT-AT. The tide of the Battle of Hoth turns as the first AT-AT falls. AT-ATs continue to descend upon the Rebel forces. Snow speeders fly off to engage more AT-ATs. Luke lies in the snow after his T-47 speeder is shot down. 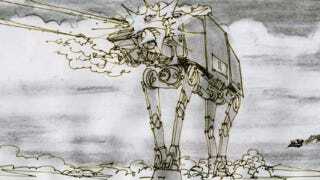 One of the few scenes from ESB to feature an AT-ST. More were intended to be present at the Battle of Hoth, but they were removed due to filming constraints. The very memorable scene where Han Solo commands Chewbacca to "Punch it!" In the final scene, Leia is in the Millennium Falcon as well - maybe she wasn't invited in this early version. From a private collection. The Millenium Falcon leaves the Rebel base on Hoth, only to end up in the belly of a giant snake living in an asteroid. From the Propstore of London. R2-D2, mounted in Luke's X-Wing, as the duo make their way to the Dagobah system.